George Hedley is the founder, 100% owner, and CEO of HEDLEY Construction & Development, Inc., a major commercial, office and industrial building general contractor and developer headquartered in Costa Mesa Southern California. 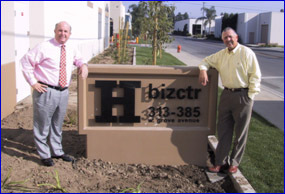 He has over 30 years of experience building, developing, and managing commercial, industrial, and office projects primarily in Southern California and the greater Las Vegas area. HEDLEY has built more than 300 projects totaling in excess of 15 million square feet costing over $750 million. HEDLEY has been listed numerous times in the Top 20 largest general contractors headquartered in Orange County, California. The many projects built and developed include: commercial buildings, industrial buildings, retail & shopping centers, manufacturing & corporate headquarters, office buildings, medical buildings, self storage mini-warehouses, tenant improvements, renovations, and off-site street improvements. Hedley Builders, Inc. was founded in 1977 as a general contractor and steadily grew to $50 million annual volume by 1987. 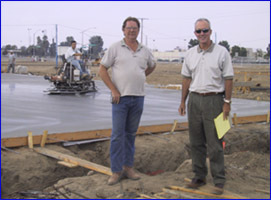 In 1996, Mr. Hedley changed the company name to Hedley Construction & Development Inc. Hedley now focuses on full service construction, real estate development, and investment real estate including: property acquisition, project development, project entitlement and permitting, project financing, pre-construction, construction, project management, supervision, sales and leasing, and property management. Hedley’s current projects average from $2 to $20 million. As a general contractor, HEDLEY builds several projects every year averaging between $2.5 to $10 million dollars each. As a real estate developer, George Hedley has participated as a principal or manager in the ownership, investment, development, acquisition, planning, design, construction, and management of over 1,500,000 square feet of commercial, industrial and office projects. In addition, George Hedley owns and manages over 750,000 square feet of office and industrial buildings. Hedley Construction also provides personal "hands-on" construction management consulting, construction litigation support, and other specialized construction services. These services include: project completion analysis, consulting, feasibility studies, inspections, management, estimating, cost analysis, scheduling, defect analysis, dispute resolution and expert witness support. George also owns and operates HARDHAT Presentations, and is one of the top construction industry speakers in the United States. 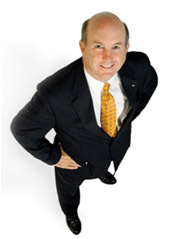 He presents over 50 keynote speeches and seminars annually to national associations and companies across the USA. 1992 – Now Hedley Construction & Development, Inc.
Ernst & Young and ‘Venture’ magazine, Orange County, Ca. HEDLEY Construction & Management Inc.
Ken Hansen is a development partner with HEDLEY Construction & Development Inc. in charge of Development Services. Hansen’s association with HEDLEY combines an extensive background in finance, property management and the development of apartments, industrial and commercial projects. Hansen has syndicated and constructed over 1,000 apartment units, property managed over 5,000 dwelling units and developed multi-tenant for lease and sale industrial projects. Hansen’s real estate career was preceded in commercial banking at First Interstate Bank. His entry into real estate was the result of purchasing a customer managing and constructing apartments in Florida and Southern California. In addition to real estate development, Hansen dedicated 10 years to alternative energy development and was responsible for the construction and sale of three 60 mgw electrical plants in Delano, Livingston and Redding. The development partners on those projects included United Technologies, Zurn Industries and Signal Wheelabrator Industries. The primary role with HEDLEY for Hansen will be the identification of acquisition, construction and development opportunities. His scope of responsibilities includes land acquisition, development services, project approvals, project and asset management and property management. He will also secure equity capital, mezzanine funding, construction loans and permanent financing. He will also focus on identifying land for development and value-added investment opportunities. Graduate School of Credit & Financial Mgt. Chris Christe is a full charge construction manager in charge of construction operations. Chris came to Hedley with 27 years of experience of building a variety of construction projects including industrial tilt up parks, out patient medical facilities, tract and midrise residential projects. His responsibilities include client development, pre-construction services, systems administration, estimating and project management. Chris started in field operations as a superintendent working with both on and offsite development on troubled sites and gradually became involved in corporate systems, contract administration and project completion scheduling. 23 Industrial Buildings 63,000 s.f.